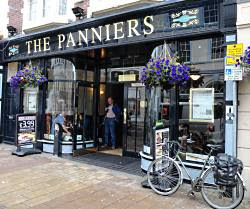 The Wetherspoons pub most aptly named for cycle tourers - The Panniers (right), which I mentioned in a previous post - has set me and a few fellow cyclists thinking about other boozers named for cycle parts. 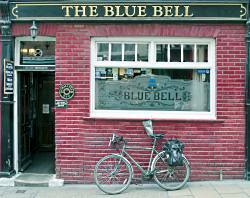 Nigel, a Cambridge Cycle Campaign stalwart, in the Comments section of that post, found a community pub The Rusty Bicycle in Oxford, “which looks very promising, if only I ever had a reason to visit the Other Place". And as fellow commenter David Nottingham slyly suggested, any Wetherspoons counts, as it’s part of a chain. 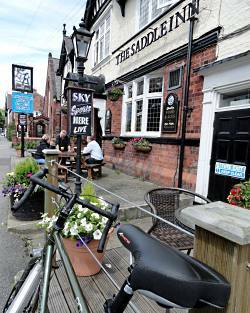 Anyway, today I nipped down to two York pubs that could be assembled as part of a bicycle. The Blue Bell (right) is one of the town centre’s top pub experiences, a cosy, woody gem down Fossgate with good real ale and an interior unchanged from Edwardian times. As, sadly, is the nonexistent cycle parking – in those days, no doubt, they could safely lean their unsecured bikes against the wall outside. And the Saddle Inn (right), just south of the city limits in Fulford, is a fine main-roadside local, with beer garden and four real ales at under three quid a pint. 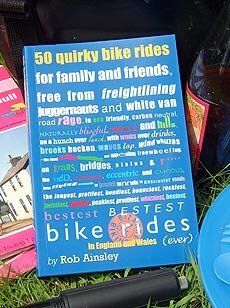 A quick Google frenzy throws up a few more velopubs. The Old Pump, Barlow (between Sheffield and Chesterfield) reminds me that I really ought to upgrade my ancient five-quid Zéfal. Add The Frames, in London W10, to The Wheel, Naphill, in the Chilterns north of High Wycombe – a late 1700s real ale place – and you have the makings of a new machine. While there’s a natural twinning between The Hub, a hip-looking bar in the centre of Liverpool, and The Bearings, in rather less-hip Newark. * Erm, it's not Indian. See Comments! Good point. 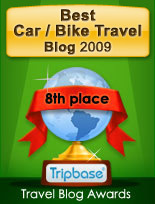 I'm probably confusing it with the Bombay Bicycle restaurant in London! I'll edit the post - thanks!